Do you hang out in IRC channels often? And do you use pastebin.com or other services to show the users snippets of your source code that illustrates a problem you have? Then you no longer need to switch between your Eclipse IDE, a webbrowser and the IRC chat window. I have finished today the first alpha version of a small Eclipse Plugin that adds a new menu and toolbar button to the Eclipse Workbench. The targets are configurable in the preferences and are persisted in your Eclipse configuration location. That means you do not have to re-configure the targets for each workspace (a feature I would wish for a lot of Eclipse options to be the default). You can also install the "CopyTo JDT" feature which allows you to copy Java methods or classes from the Outline view, the source editor or the Package Explorer. For "pastebin.com" this will also enable Java syntax highlighting. Since the whole plugin code is available at github others could contribute specialized modules for Ruby, PHP, etc. After the selected content was sent to the target and the target returned a valid redirection URL (or JSON response, that contains a URL) there are several actions possible. The default action is the "Copy to clipboard" action which is supplied by default. You can install additional "PasteTo" actions like for direct pasting into your favorite IRC client. Of course having many actions will slow down your workflow so there will be a mechanism to select a default action and display the dialog only if you hold down the "CTRL" key. If there is only one action available, then no dialog will be displayed. And for the "Copy to clipboard" action you can disable the initial warning it gives you when the clipboard contains (probably) valuable data. I am already using the plugin in my daily Eclipse life and if you want to give it a test run you can add the Update URL http://pke.github.com/CopyTo/update/ to your Eclipse Installation. Don't forget to select at least the main feature and the "pastebin.com target". The update manager will warn you that the features are not signed but you can safely ignore the message (if you trust my code :) You need to restart the workbench to get the pastebin.com configuration visible to "CopyTo". That's currently an known issue. I would like to hear from you, especially if you have suggestions for the workflow. I've tried it out and it works very well, both for resources and the editor selection. I have a question about the preferences: I tried to create a new target by copying and pasting an existing entry, and then changing the target name and url from pastebin.com to tdt4100.pastebin.com, which is the pastebin for my Java course. After doing this, I had to targets. However, when trying it, it seemed I had actually overwritten the existing pastebin.com entry, since only tdt4100.pastebin.com was available in the menu. Opening the preferences revealed only one entry, the one I had entered. Thanks Hallvard for trying out. The behaviour you are describing is due to a bug in the copy/paste code. What it does, it copies the entire object, including its ID. 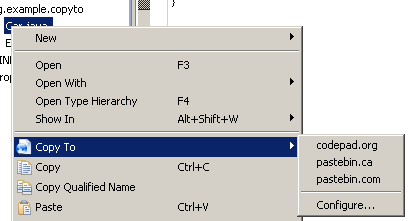 When you paste you essentially have the "same" object in the list twice. I will change the copy or paste code so that it always creates a new ID. I will update that and report back here. Eugene, no clipboard tracking involved here ;) The outline selection is specific to the provider of the content outline so you have to know who is providing it. Using a simple adapter one can convert from JDT models to Copyable. Check out the source code, its pretty simple. @Hallvard: I have fixed the paste code. You can update the plugin and test your workflow again. So was this abandoned 2 days after it was posted ? Or is it still maintained elsewhere ? Feel free to extend it, its open source :) I no longer maintain it. It was more of an exercise for me, and I provided it so others could use/learn from it. Really nothing beyond 'how to get it to work' - trying to install it on my Kepler with ADT it asks me to uninstall a long list of stuff I'm pretty sure I need, and informs me that even if I do, it won't install any of the packages I selected. Well, I cannot help with that, as I have never tried to run it under Kepler. But you can probably just load the projects into the Kepler IDE and update the dependencies quickly.